Two-Day, VIP & Single Day Tickets On Sale Now! March 7, 2017 — MAMBY ON THE BEACH, Chicago’s only beachside summer music festival, is thrilled to announce the artist lineup for its highly anticipated third year! 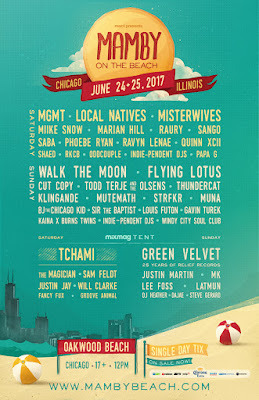 The musically eclectic festival will take place from Saturday, June 24 and Sunday, June 25, once again on the grassy-field and sand-swept coast of Oakwood Beach. For those with an open mind and a curious heart, Mamby On The Beach is an opportunity to escape the monotony of our daily routines and explore the most precious parts of our collective being. As Mamby brethren, united around common bonds of freedom, expression and beauty, we invite you to bring the memories made here wherever you go.